Below are examples of various types of 18th and 19th Century Toby Jugs. This is just a small selection of the different styles produced, and some of these jugs can be found in a number of variations. Where possible I have tried to picture some of the less common versions made. Please note, the jugs on this page are NOT FOR SALE. 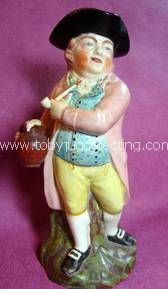 This is the style that most people associate with a Toby Jug - seated male figure, wearing a long frock coat & tricorn hat, clutching a foaming jug of ale in one hand and holding a pipe in the other. He is the standard size of about 9.5" tall. This particular version dates from around 1800/1810 and is particularly well painted, especially the detail to his clothing . The Snufftaker is one of the most common types of toby to be found. He is different to the usual toby as the figure is standing. 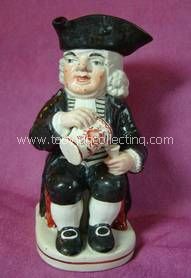 He holds a snuffbox in one hand and is taking a pinch of snuff with the other - a popular pastime in the 18th century! The snufftaker has been made in a number of variations over the years. 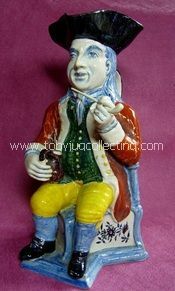 This particular one dates from around 1840 and was made by the Portobello pottery. 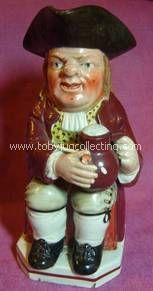 A more rare version can be found where the same figure is clutching a jug between his hands. This is another of the few tobies that can be found standing rather than seated. Known as the Hearty Goodfellow he stands on a grassy mound. Behind him is the trunk of a tree, a branch from which curls round to form his handle. The Hearty Good Fellow usually holds a jug in one hand & a long pipe in the other, although occasionally he can be found holding a goblet rather than the pipe. Whilst the male Snufftaker is a fairly common jug, the female version by contrast, is fairly rare. She is believed to have been produced from around 1840-50 and her clothes are typical of the style of the mid 19th century. She is very attractively painted in nice bright enamelled colours. 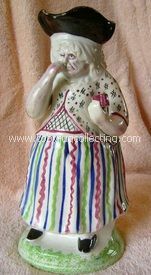 I really like this jug - just look at the expression on her face, it says a lot about the effects of snuff taking! Martha Gunn is probably one of the most sought-after female tobies. She is one of the earlier jugs made, and unusual as she depicts a real person. Martha Gunn lived in Brighton in the 18th/19th centuries & rose to fame when in her capacity as a "ladies bather" (helping the gentry from their horse-drawn bathing machines into the sea) she also became bather for the young Prince Regent. This particular model is interesting as she holds a jug in her hand rather than the usual gin bottle. The Drunken Parson wears the clothes typical of a cleric of the time. His hat is slightly skewed & he has a rather dazed, almost sinister leer on his face. The one pictured here is about 8" high, although he can be found ranging in size from 6" to almost 10". Sometimes referred to as Dr Johnson, he wears the 'physical' or full bottomed wig popular in the early 18th century. It is generally felt that he was modelled by Enoch Wood, although there is no proof of this. This jug dates from around 1780. 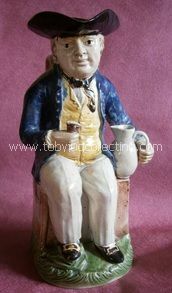 Produced by Ralph Wood it is very well modelled and detailed as you would expect from this infamous potter. It depicts Jack Tar sat astride a chest and gazing out to sea. He has a jug in one hand and a glass in the other, and there are waves lapping around his base. This jug can sometimes be found with an anchor between his feet. A very large jug at a full 11.5" tall. This is one of the real aristocrats of the toby family. He is about 11" tall and has very distinctive features - as you can see he is much more slender than the traditional toby. 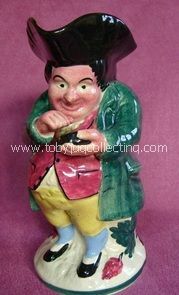 It has been said that this jug is modelled on Ralph Wood the elder, although as far as I am aware, there is no evidence to prove this. This very attractive and impressive jug is a more unusual version, decorated in tin-glazed enamels. 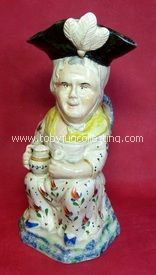 This is one of the most sought-after toby jugs you can find. No collection is truly complete without a Thin Man. Dating from the 1770's and often attributed to Ralph Wood, the Thin Man depicts a very slender figure, seated, drinking ale. 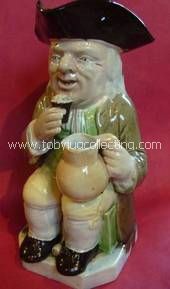 He is very finely modelled and decorated in lovely translucent glazes. This version holds a goblet to his lips and an empty fluted jug in his hand. They can also be found holding a pipe and jug. This is another Ralph Wood Jug that every collector strives for. Potted by the famous Ralph Wood during the mid 1780's, the lovely transluscent pale glazes, crisp modelling and great attention to detail are everything that one would expect from a jug made by this renowned potter. Tobies in this style, with the glass raised slightly towards his mouth, are sometimes referred to as the 51, as they can occasionally be found with this number impressed to the underside of the base.